Does an equation exist to describe a square? What about any polygon? Yesterday I saw some awesome Mr Men Math posters created by @solvemymaths (www.solvemymaths.com) and have already stuck some of them up in the corridor at school. Mr Astroid particularly caught my eye as one of the interesting Mr Men shapes. 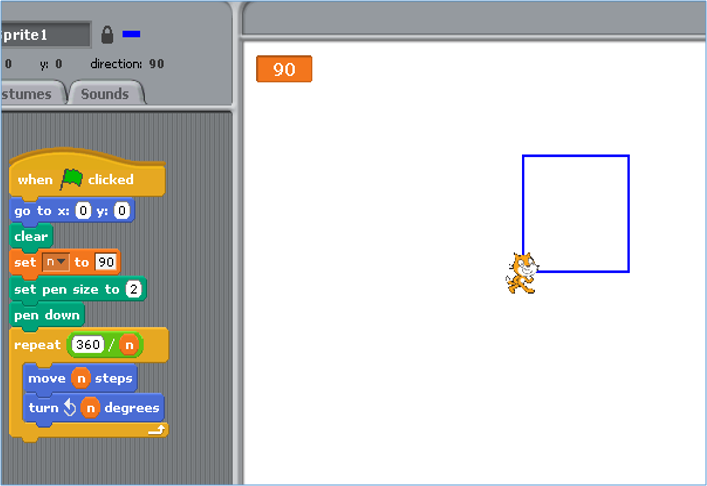 So the standard way to create a polygon via programming is to get on a programme, such as hopscotch, logo or scratch – and create a mini-script to move and then rotate (by the exterior angle) and move and then rotate, etc. until you get back to where you started. Obviously you need to use values for the rotation angle (exterior angle) that are factors of 360 degrees in order to make a connected shape. Using 90 degrees as the rotation angle you get a square. After I reached the modulus function above, I decided that polar coordinates might help with going further but couldn’t think of how this might work – decided to look it up. I found what I was looking for (see this post – thank you to the people who posted) but thought I’d describe the first part in a bit more detail so that students can understand the base of the function and then play around with second part which is fun and interesting. There’s no way I could’ve come up with this but by playing around on Desmos I’ve built up an understanding of why each cog in the function exists. If you haven’t come across polar coordinates before, go and look up the standard mathematics and then observe the picture below. I decided to stick with a square for the example but could have chosen any polygon for this example. 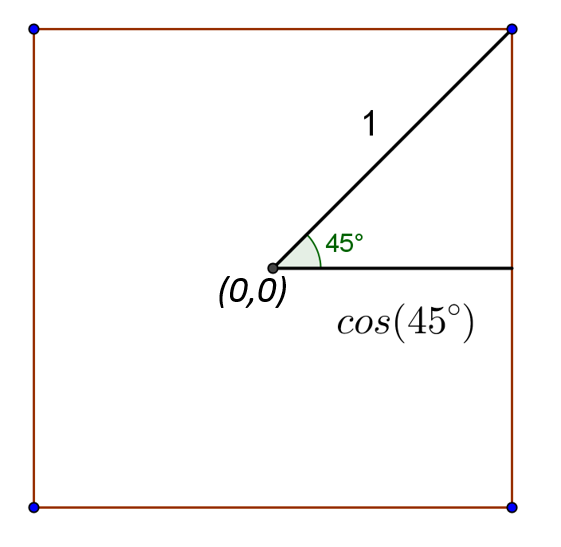 The x co-ordinate of the right side of the square is x = cos(45). If it were any polygon with n sides, it would be x = cos(180/n), or in radians, x = cos(pi/n) (1). 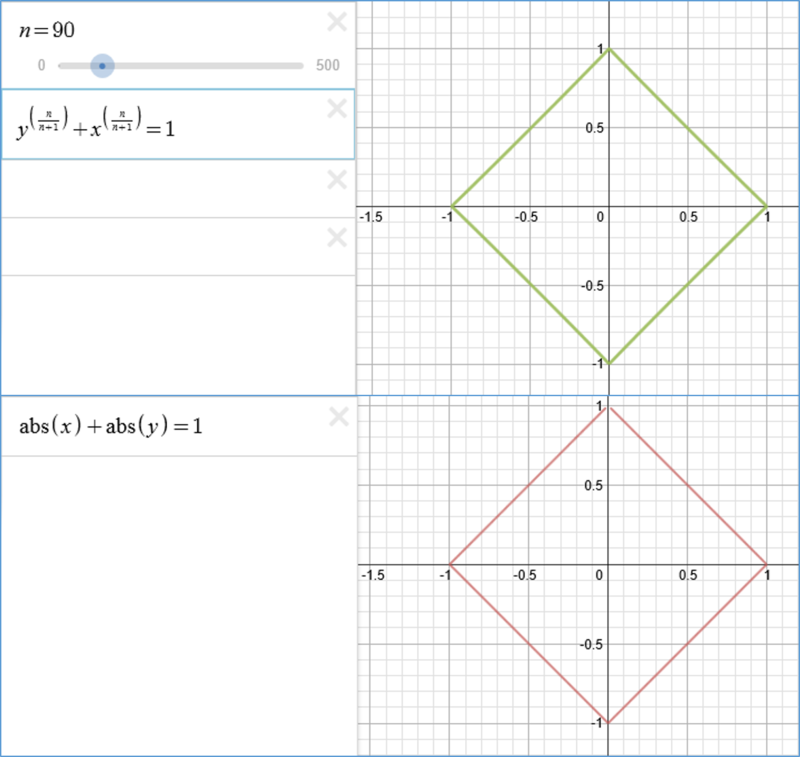 Click the picture to go to the Desmos File. The floor( ) function rounds a number down to the closest integer. It’s interesting to try the equation above without the floor( ) to see what happens and check this with different values. Indeed, without the floor we have r = cos(pi/n)/cos(-pi/n) . Thanks for inspiring some new learning @solvemymaths! This entry was posted in Uncategorized and tagged function for polygon, Polygon, square. Bookmark the permalink. 2 Responses to Does an equation exist to describe a square? What about any polygon? 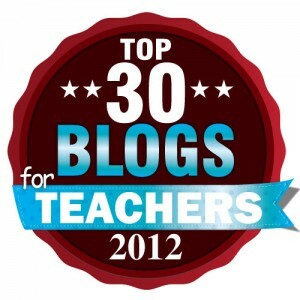 love the desmos file – never used the site before – so just signed up! This topic will help me alot define square shape. Do you have any reference for this topic you wrote? Thank you very much for your sharing.